Think you don’t need flood insurance because you don’t live near the ocean? Or because your mortgage company doesn’t require it? Or because you’re in a low to moderate hazard area according to the National Flood Insurance Program? When it comes to choosing flood insurance, there isn’t much choice. The overwhelming majority of policies are backed by the National Flood Insurance Program, part of the Federal Emergency Management Agency, even though they must be purchased through an insurance broker. The National Flood Insurance Program maps land and denotes areas as either low to moderate or high hazard zones. People outside of high-risk areas file more than 20 percent of claims and receive one-third of disaster assistance for flooding, according to the NFIP website floodsmart.gov. Any surface water that enters your home from what was previously dry land consisting of two or more acres or two adjoining properties, one of which is yours, is considered a flood, whether caused by rain, water main break, or something else, says Ron Haltermon, an NFIP expert. Policy costs vary depending on the amount of coverage purchased, deductible selected, and flood zone risk. Plug in your address and get an instant response on whether your risk is low to moderate or high to get an idea of what your annual premium might be, using the flood risk profile tool on floodsmart.gov. Homeowners may choose coverage for up to $250,000 for a dwelling. Be careful — ask whether you’ll be covered at full replacement value. To be eligible for replacement cost instead of depreciated value, you must own a single-family home carrying flood insurance in an amount that is at least 80 percent of its replacement cost or the maximum $250,000, according to FEMA spokeswoman Hannah Vick. Homeowners can also add up to $100,000 of coverage for contents, usually under a separate policy with its own deductible, but it’s for depreciated value, not replacement value. There is no option for replacement value on contents even if you are willing to pay a higher premium for it. Renters can also purchase contents coverage. For personal contents in a finished basement — or any room considered below grade — coverage is extremely limited. Swimming pools and fences aren’t covered. There is no coverage for additional living expenses — renting another home while yours is repaired. There’s no upgrade to meet new building codes. Anthony Ballato, a litigation attorney from Massapequa, calls the NFIP program “lousy” insurance. “It’s shocking to people to find out how pitiful their coverage is,” he says. 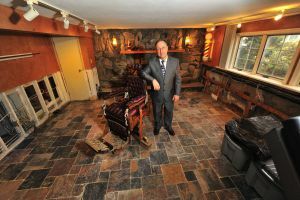 His den is below grade and was flooded in Sandy; structural damage is covered, but he says he won’t be reimbursed for a $5,000 gas fireplace he had installed two weeks before the storm, even though it looks like “the white tornado” tore through the den. He says he thinks the government should offer more options for better protection like homeowner’s insurance does. Nevertheless, because homeowner’s insurance normally won’t cover anything in the event of a flood caused by stormwater surges, you may want to consider a flood insurance policy so at least you have some protection, insurance experts say. If you want better flood coverage, purchase what’s called an “excess flood insurance” policy kicks in after your coverage through the NFIP is exhausted; you must have the maximum $250,000 federal coverage before you can add excess flood, says Tom Becker, director of development for Wells Fargo Special Risk Inc. It also doesn’t offer replacement value for contents, Becker says. You can, however, add coverage for additional living expenses and even sometimes basement contents coverage, Becker says. We understand your suffering. Attorney Anthony Ballato has experienced first-hand the devastating effects of Hurricane Sandy by having gone two weeks without heat and power in not only his business, but his home as well was seriously damaged by the flood.